The Black History Month menu at Wright State University in Ohio featured fried chicken and collard greens. A dining service thought it was offering Wright State University college students a "cultural dining experience" with "authentic and traditional cuisine" when it decided that fried chicken and collard greens should be added as part of the Black History Month menu, according to the Associated Press. 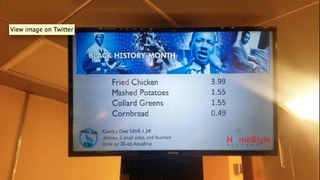 Shocked students at the Ohio school took photos and shared on social media images of the menu, which carried the words "Black History Month" across the top complete with photos of several famous black leaders. Below the images was the menu for the day, which featured "fried chicken, cornbread, mashed potatoes and collard greens." Many saw the choice of cuisine as disrespectful and inconsiderate, noting the racial stereotypes that are associated with African Americans, fried chicken and collard greens. On Thursday, Wright State University and its dining services vendor apologized. "I apologize to anyone hurt by the display,” university President David Hopkins wrote in an email viewed by AP. "To our credit, the menu was quickly removed. But the larger question remains: Why was it done? I will find out. We will take steps to prevent this kind of behavior occurring in the future." Chartwells Higher Education Dining Service wrote in a statement viewed by AP that it "could have done a better job providing context for what was meant as 'a cultural dining experience.'" The dining service added that it was attempting to celebrate the month with "authentic and traditional cuisine. … In no way was the promotion associated with Black History Month meant to be insensitive." The school's vice president of multicultural affairs and community engagement, Kimberly Barrett, told AP that she understood the dining service's wanting to be inclusive but that it missed the mark. "I think many times, in attempts to be inclusive and to honor diversity, people who might be in the majority community, or in communities other than the ethnic groups they're trying to honor, sometimes get it wrong." Barrett told AP. She added that she was glad the university decided to take down the menus quickly. "I was really hurt … extremely hurt," Billy Barabino, a senior and president of the school's Black Student Union, told the news service. "For me, it was a knock in the face for African [and] African-American individuals who have fought for us to be progressive. I was extremely offended by it because it minimizes who we are as a people." This isn't the first time that someone has made the connection to fried chicken and collard greens as commemorative Black History Month food. In 2010 drummer of the Roots Questlove caused waves when he posted a photo to Twitter of NBC's lunchroom banner that boasted a similar menu of "fried chicken, collard greens and jalapeno cornbread." And just last year, a private school in Indianapolis was forced to apologize after it served fried chicken and collard greens to students in an attempt to celebrate Black History Month. Read more at USA Today-College.